An ethnic Uzbekistan woman has filed a petition with the National Human Rights Commission after she was denied entrance to a sauna here. Such an action was possible because there is no law on discrimination by race, according to a support center for immigrants. “Many foreigners face such discrimination often but mostly they remain silent because they don’t speak Korean well and don’t know where they can appeal,” said Ku Su-jin, whose Uzbek name is Karina Kurbanova. Assisted by a civic group, she held a media briefing at Gyeongnam Migrant Community Service Center in Changwon, South Gyeongsang Province, Thursday. “I’m filing the petition on behalf of other foreigners and especially our children including my seven-year-old boy, as I don’t want him to be discriminated against because of physically appearing different to Koreans,” she said. Ku visited a sauna in Busan at around 3 p.m. on Sept. 25. But the employee denied her entry, saying foreigners are prohibited. She reported this immediately to the police. “The sauna worker told police that foreigners are not allowed there because they may make the water dirty. He also said Koreans customers don’t like using the facility with foreigners because in the town there are many foreign women working at bars and there were rumors that some have AIDS,” she said. 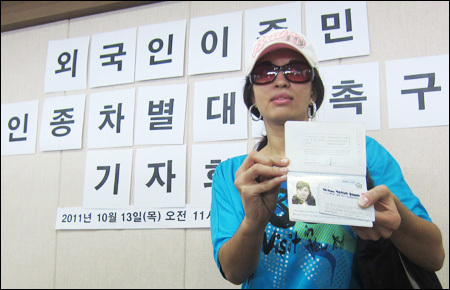 Ku is legally a Korean as she obtained citizenship in 2009 after marrying a Korean man. She told this to the owner, but he said she was a foreigner by appearance. Police officers said there is no law to regulate such racist discrimination, advising her to go to another sauna, she said. Officials at the center, who are supporting Ku’s petition, said the owner took advantage of a legal loophole regarding discrimination. “There are laws banning discrimination by gender or by worker’s status. But there is none governing discrimination by race, not only do Koreans discriminate against foreigners but also Koreans discriminate against other Koreans like in Ku’s case,” a director of the center said. The director said if the rights commission recommends the sauna to change, the group will help Ku file a civil suit against the sauna owner for the mental distress she sustained. She said what Ku and the center ultimately call for is the establishment of a law banning discrimination by race, against both foreigners and naturalized Koreans. “In these modern times when 1.3 million immigrants live here, it is shameful that they have their human rights infringed upon and are deprived of many entitled rights in daily life only because they look different or they came from other countries. Korea claims to stand for multiculturalism, but is far short of laws and systems for immigrants,” the director said. 우즈베키스탄 출신 여성이 사우나에서 출입금지를 당했다며 국가인권위원회에 진정을 냈다. 사우나 주인은 이 여성이 귀화한 한국임에도 불구하고 외모로는 외국인이라며 입장을 막았고, 외국인들은 물을 더럽히거나 에이즈를 옮길 가능성이 있어서 안된다고 말했다. 이주민 지원 단체는 이러한 출입금지가 차별에 관한 법령이 없기 때문에 가능하다고 말한다. 한국 이름이 구수진인 이 우즈벡 출신 여성 카리나 쿠르바노바씨는 기자회견에서 “많은 외국인들이 이러한 차별을 겪지만 한국말도 잘 못하고 어디에 얘기해야 할지 몰라서 그냥 넘어간다. 나는 다른 외국인들과 특히 우리 아이들을 위해서 진정을 내기로 했다. 나는 우리 7살 아들이 한국인들과 다르게 생겼다는 이유로 차별받는 것을 원하지 않는다”라고 말했다. 구씨는 지난 9월 25일 부산의 한 사우나를 찾았다가 외국인은 출입금지라고 입장을 거부당하자 경찰에 신고했다. 구씨는 “사우나 주인은 경찰에게 외국인은 물을 더럽혀서 안들여보낸다고 했다. 그는 또 주변에 술집에서 일하는 외국 여성들이 많고 몇 명은 에이즈에 걸렸다는 얘기가 있어서, 한국 손님들이 외국인들이 오는 것을 꺼린다고 진술했다”고 말했다. 구씨는 결혼 후 2009년 한국에 귀화해 법적으로 한국인이고, 이 사실을 얘기했지만 사우나 주인은 여전히 구씨가 외모로는 외국인이라고 말했다. 경찰은 인종 차별을 제재하는 법률이 없어서 어쩔 수 없다고 말하며 다른 사우나를 안내해주겠다고 했다. 구씨를 도와 진정서를 접수한 경남이주민센터 관계자들은 사우나 주인이 법의 허점을 이용했다고 말했다. 한 관계자는 “성별이나 비정규직 차별에 관한 법률은 있지만 인종에 대한 차별에 관한 법은 없는 실정이다. 내국인의 외국인에 대한 차별, 혹은 구씨 경우처럼 내국인의 내국인에 대한 차별에 대한 법이 없다”고 말했다.